CORAL GABLES, FL — “Robot Law” might sound like science fiction, but it’s an increasingly important area of law, and the title of an exciting new book from Edward Elgar Publishing. 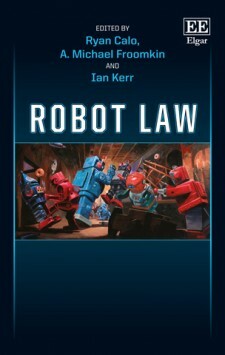 “We assembled this book because robots are on the precipice of creating a number of significant social challenges that law is currently ill-equipped to address,” says co-editor and chapter author, University of Ottawa law professor Ian Kerr. Kerr joins co-editors Ryan Calo (University of Washington School of Law) and A. Michael Froomkin (University of Miami School of Law) at the “Robot Law” book launch at the University of Miami. The event takes place at 12:30 p.m. on April 1, and is part of the annual We Robot conference. The 424-page collection includes research from engineers, ethicists, lawyers, roboticists, philosophers, and military personnel, and features original cover art by acclaimed artist Eric Joyner. Ryan Calo is an assistant professor at the University of Washington School of Law and co-director of the University of Washington Tech Policy Lab. He is an affiliate scholar at the Stanford Law School Center for Internet and Society and the Yale Law School Information Society Project. He also serves on numerous advisory boards, including the University of California’s People and Robots Initiative, the Electronic Frontier Foundation, the Electronic Privacy Information Center, Without My Consent, and the Future of Privacy Forum. Michael Froomkin is the Laurie Silvers and Mitchell Rubenstein Distinguished Professor of Law at the University of Miami School of Law and an Affiliated Fellow of the Yale Information Society Project. He is the founder of the We Robot conference, and is on the Advisory Boards of the Electronic Privacy Information Center, the Electronic Frontier Foundation, and the Future of Privacy Forum. Dr. Ian Kerr holds the Canada Research Chair in Ethics, Law & Technology at the University of Ottawa Faculty of Law. He also holds cross-appointments to the Faculty of Medicine, the Department of Philosophy and the School of Information Studies. His research focuses on the ethical and legal implications of artificial intelligence, robotics and implantable devices. We Robot is an interdisciplinary conference on the legal and policy questions relating to robots for those on the front lines of robot theory, design, or development. The fifth annual conference takes place April 1-2 in Coral Gables, FL, at the University of Miami Newman Alumni Center. We have an incredible 3-day program, starting with workshops on Thursday then a 2-day academic conference. Pre-registration is closed, bu there should be some tickets at the door. All the papers are now available online. UM faculty and student tickets are only $35 — but student readers of this blog who write to me and give me a good reason are eligible to get in free. For physical attendees, We Robot 2016 has been approved by the Florida Bar for 25.0 credits of General CLE, including 3.5 Ethics credits. General Registration is $159.00. We’re also broadcasting Friday and Saturday’s events on We Robot’s Livestream. The twitter hashtag is #WeRobot. There are signs that some time this week–maybe over the weekend? –we reached Peak Trump. That doesn’t mean momentum won’t carry him to a lot more delegates, and maybe even enough to scrape a majority, but I think the bloom is off the rose tinted glasses. Not sure if it’s the Trump misogyny, the arrest of Trump’s campaign manager followed by doubling down on the guy’s defense, the really weird panel of foreign policy advisers, the articles about Trump’s dominance games (more), or the resignation and damning open letter of a pro-Trump “super-PAC” PR person, but something gives me that feeling. Yes, lots of people have said ‘surely the GOP will come to its senses’ at various times over the past 25 years, and mostly they’ve been wrong. And I’m not exactly saying that myself, just that I’m going to guess his popularity has peaked. Dog’s ‘Terrorist-Sounding’ Name Freezes Online Payment. The guy wrote “Dash” in the memo line of his payment to his dog-walker, “Dash” being the dog’s name. Chase bank decided that (1) this sounded suspiciously like “Daesh”, a terrorist group; (2) there was a meaningful possibility that a terrorist would write in the name of a terror group on a check in case the recipient didn’t know what it was; and (3) there was a meaningful possibility that the terrorists used the “remove every other vowel” code. No word on what the intended recipient of the check thought about having a payment held up for something like this. Thank you Larry Solum! More here. Previously: Just Got My Advance Copy of Robot Law. Papers for We Robot 2016 are now available from the Program Page — look for the colorful hyperlinks. If you’re coming, or if you are planning to follow along online, you will want to read as many of the papers as you can before the event. We Robot authors do not present their papers; instead we jump straight to the discussant, who summarizes the paper and then offers comments. The author(s) respond briefly, and then we turn it over to our amazing attendees for their questions and reactions. This makes for a much more substantive session, but it works better if you’ve read the paper in advance. If you would prefer to download the papers all at once, here’s a zip file with all of the papers. And if you haven’t registered yet, don’t delay: Registration closes on Monday at 5pm, and there will be only a very limited number of seats at the door.